wire. I didn’t have to follow any specific protocol as it was blown up. 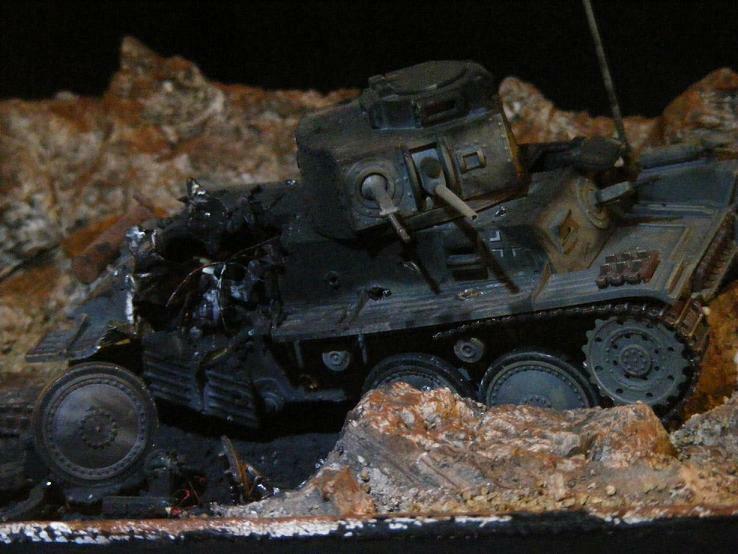 27 responses to When you build tanks, you have to do at least one of these…. Hi Steve, another teaser? Looking great (as usual). A few month ago, i have read “Tiger in the mud” written by Otto Carius, a Tiger commander and platoon leader from the eastern front, his first combat was in these 38(t) tanks. At first, they were proud of their tanks, but they were hit and he lost some of his teeth (he was lucky) After all, he quotes this type as a cardbox on tracks ! me was how happy and proud they were to have a Kulble at there disposal. These guys really loved these (jeeps). So here is a fun question. How many times did hey say in the book “We blew them to bits” I would say many times. Also was your book the Stackpool series of publications? I am glad you liked my model and photos. Your dio is great Steve, and yes, the Kübelwagen was a beloved vehicle, my dad served in Russia too and he told me a lot about the VW, in autumn 1941, the russian “streets” became deep muddy swamps, even tanks get bogged down, they put snow chains over the tyres and had no problems. What is the stackpool series? Mr. Carius is still alive and well, working still as “retired” in his “Tigerapotheke”(apothecary shop) and i got the book via his online shop with a signature. I guess a lot of times, they blew a lot! The attack against the russian village in summer 1944 was just epic, he quotes, his gunner has shoot down a Stormovik as well. There is a lot of discussion about the worth of the Tigers, but these vehicles were the live insurance for the crews. The tank was easy to drive and could turn on a dime, he didn t like the Jagdtiger, because it was too heavy. Anyway your build is great, the damage is very realistic, well done. Nice work Steve. Well done burnout. That is not an easy effect to achieve. I rarely build tanks, but have toyed with the idea of making a knocked out T-34 from the first weeks of the Korean War. I found some interesting pics of such vehicles. Your project gives me inspiration to follow through. burntout. From tanks to aircraft to cars, and just about everything you meant to have look (sooty) and really Black! Here is what I did on this. After the model was completed in its exploded form. I took a long piece of sprue, lit it with my lighter, and held the model upside down and let the soot from the burning plastic sprue cover the exploded area. Practice this a bit and you will see what I mean. Thanks Bob, I ran out of fire crackers! I know you were thinking this. I know I was! Haa Haa! !’ Maybe someday I’ll grow up. NOT!!! Thanks for the well done Bob. Nice job…looks very realistic [and a handy tip re the burning sprue…I know what that residue can do]. I think I learned this technique in about 1965 when my older brother said, “Hey Steve, you gotta see this!” He took a old model tank and put a open tube of Testors glue inside. Then proceeded to light it on fire. We had a big dirt back yard. And safety was a big concern, (right). My first exposure to Napalm. Don’t try this at home Kids. I guess that is where I learned this technique. I agree. The effect is immenduate and effective with, as you say, a minimum of fuss. I haven’t done a German version, but did do a Bronco SU-152 in a similar vein. I’ve seen that Stalingrad do a range of Russian tankers – one set has a wounded tanker being pulled out of the escape hatch – which I may use to ‘finish’ it as a proper vignette sometime. Looks good BUT go back and burn out those tyres. All that fire and the tires turn to light grey ash…..
Good tip Bill. Now where is my light grey ash paint bottle. Nice diorama Steve! Great, and relatively simple way, as far as materials go, to show the blowout. Did you just thin the plastic and puncture and bend out the hole to show the entry hole? tubing. Wadded it up, stuffed it in the hole, and bent and arranged it with a pair of tweezers until it looked messed up enough. Dabbed some superglue to hold it in place. Gave it a shot of Dullcoat, and did the burning sprue effect. Once I secured it to the diorama I glued down the tracks to make them look weighted. Well that’s about it. Thanks Ramon, To save precious computer screen ink I posted the basic instructions above. Every one I have done of these is very different. So grab that old dust queen and give her a go. It really is a fun project. Like the idea about using natural smoke plumes to weather around damage. Thank you Simon. I would like to add that after you do this effect. Give her a good shot of Dullcoat to seal up the soot. this will avoid the giant fingerprint, and still look very black and sooty. I really like this one Steve! Awesome diorama. Very realistic. Can’t wait to see your next diorama!!!! Thanks Morne, I am working on a winter dio for my brother in law for his King and Country, Tiger. These are the very expensive premade collectibles. These do take a lot of time, but I am enthusiastic about this one. Cool one Steve. I love these vingettes you crank out! Some great painting and effects on this one. Thanks Paul, I just can’t go out to the patio and load a firecracker anymore. So I have to do these in a more controlled environment. Without the big bang! This was a fun dio. Thank you Jean-Marie, I am glad you like my madness. A belated ” OUTSTANDING” on this. Thanks Frank.. Now you can’t say I never answered your comment. What do they say. Better late than never. Thanks again.